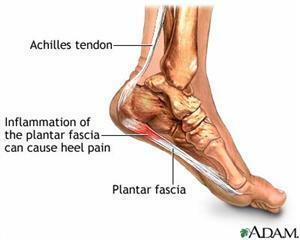 Plantar fasciitis is a common cause of heel pain, occurring when the plantar fascia is excessively stretched. The plantar fascia is a broad band of fibrous tissue that runs along the bottom surface of the foot, attaching at the bottom of the heel bone and extending to the forefoot. When the plantar fascia is excessively stretched, it can become inflamed and cause plantar fasciitis. With fasciitis, usually the bottom of your foot will hurt near where the heel and arch meet. The pain is often acute either first thing in the morning or after a long rest; resting causing the plantar fascia to contract back to its original shape. As the day progresses and the plantar fascia continues to be stretched, the pain often subsides. Flat feet or overpronation, which results in the arch collapsing upon weight bearing. This is the leading cause of plantar fasciitis. Over-pronation occurs in the walking process, when a person's arch collapses upon weight bearing, causing the plantar fascia to be stretched away from the heel bone. A foot with an unusually high arch. Excessive weight on the foot usually attributed to obesity or pregnancy. Anyone can develop plantar fasciitis, but there are individuals that are more at risk than others. Some are related to your physical body type, gender, or age, while others are more about your habits and lifestyle. Dr. Contento explains what could be causing your heel pain. Women. Women are somewhat more likely than men to be affected by plantar fasciitis. Pregnant women are especially vulnerable. The midlife age bracket. The age range with the highest risk of plantar fasciitis is 40 to 60 years old. The overweight. With the American population growing larger and larger, we will undoubtedly be seeing more plantar fasciitis cases as well. Then extra weight on the body puts stress on the plantar fascia. People with low or high arches. Having flat feet or especially high arches is associated with greater risk of plantar fasciitis. If your feet are either very flat, or very arched, the way you walk may vary from the standard gait; this, in turn, puts unnecessary pressure on the plantar fascia. Jobs that require a lot of standing. Occupations where someone has to stand or walk on hard surfaces all day are often hazards when it comes to plantar fasciitis. Certain kinds of exercise—or too much exercise, too fast. There are certain forms of exercise, like running and dancing, which inherently put more stress on the plantar fascia. Some people will also try to do too much exercise before their body can handle it and they will injure themselves. Wearing the wrong shoes. You need shoes with excellent arch support and cushioning. Shoes with thin soles, such as flip-flop sandals or high heels, do not provide the type of proper support that the foot needs. Your heel hurts in the morning due to the tightening of your Plantar Fascia, a ligament that runs on the bottom of your foot from heel to forefoot. During the day your plantar fascia stretches out, once you stop stretching that ligament it restricts. Then when you start walking again, or get up from a seated position you feel that pain again in your heel. The mornings are particularly sensitive for foot pain because the plantar fascia has been resting and restricted all night so that first step off the bed is especially painful. Some conditions mimic a “stone bruise”, where it feels like one stepped on a rock. Usually this feeling is the result of inflammation of the tissues causing this painful feeling. Two conditions commonly cause this type of pain, depending on the location on the foot. If it is in the heel, then usually the cause is plantar fasciitis. When the pain is located in the ball of the foot on the bottom behind the toes, an inflammation of the joints in this area is usually the cause. This may be called “metatarsalgia” or “capsulitis” and is due to abnormal pressure upon these joints. A heel spur is an abnormal bony growth on the heel bone. They are typically not painful. When located on the back of the heel, they can be painful. In those cases, they are many times associated with Achilles tendinitis. Most people associate heel spurs with pain on the bottom of the heel. Even though an x-ray make show a heel spur, the real problem is an inflammation of the arch ligament called the plantar fascia. Some doctors may refer to this as "heel spur syndrome". We typically refer to this as plantar fasciitis. Safe and effective treatments for plantar fasciitis are readily available. The cause of your plantar fasciitis will determine the treatment course your Gastonia foot doctor will recommend. Prompt diagnosis and treatment will result in a more rapid resolution of the condition, whereas after several months of symptoms, the condition becomes chronic and more difficult to treat. Diagnosis is usually made with x-rays to rule out a bone tumor or stress fracture and clinical exam. Certain types of arthritis can mimic plantar fasciitis so occasionally blood tests may be performed. -If you have flat feet, an orthotic with rearfoot posting and longitudinal arch support is an effective device to reduce the overpronation and allow the condition to heal. -If you have unusually high arches, we recommend that you cushion the heel, absorb shock and wear proper footwear that will accommodate and comfort the foot. -Other common treatments include stretching exercises, plantar fasciitis night splints, wearing shoes that have a cushioned heel to absorb shock, and elevating the heel with the use of a heel cradle or heel cup. Heel cradles and heel cups provide extra comfort, cushion the heel, and reduce the amount of shock and shear forces placed during everyday activities. There are some simple steps you can take to try and prevent plantar fasciitis. Remember, every time your foot strikes the ground, the plantar fascia is stretched. That means you should reduce the strain and stress on it by trying not to run on hard or uneven ground, lose excess weight, and wear shoes and orthotics that support your arch to prevent over-stretching. Fortunately most cases can be treated successfully with rest, ice, anti-inflammatory medications, calf stretches, strapping the foot, immobilizing in a walking boot or using foot orthotics in the shoes. Good supportive shoes are an important part of the treatment. A “stretching splint” or night splint is also helpful. On some occasions, the plantar fascia must be released surgically to correct the condition. This is usually accomplished at an outpatient surgery center. The experienced North Carolina podiatrists at InStride Gaston Foot & Ankle Associates would love to meet you and help you reduce the pain you're feeling from plantar fasciitis. Simply call 704-861-0425 to schedule an appointment.